Cheyanne (Homepage) wrote: ThatÂ’s ralley shrewd! Good to see the logic set out so well. tom (Homepage) wrote: Wow. This is so beautiful.The bug separates well from the dark background while it is framed by red. Superb!!! 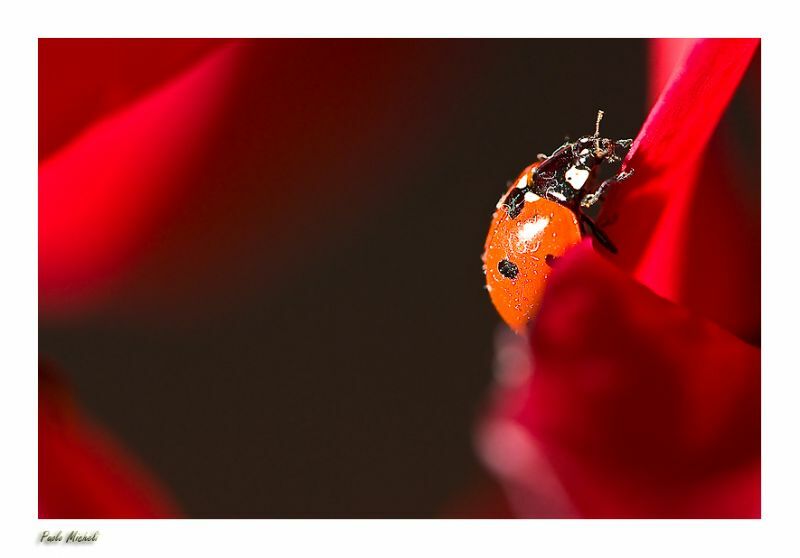 Katrin (Homepage) wrote: Stunning, I can even see little drops on the ladybug's back! Denis (Homepage) wrote: Impressionante ! Bellissima ! Chje gioco con colori rossi e arancione ! Da allargare e mettere sulla parete ! Vink (Homepage) wrote: You ar an artist ! Simply perfect ! dj.tigersprout (Homepage) wrote: wow!! splendid shot -- brilliant color!!! happy holidays to you!! Arjan - PlasticDaisy (Homepage) wrote: The focus here is spot on! What a cool capture! Nick (Homepage) wrote: WoW! Those are great reds. Love the dark shadows. NJ & SB Photography (Homepage) wrote: Muy buen macro, el color rojo intenso es muy chulo! John Maslowski (Homepage) wrote: Impressive macro shot, love the red colors and the sharpness of the lady bug. Beautifully composed. anton (Homepage) wrote: That's a very cool shot! Brilliant colours. TP@Photoskiasi.com (Homepage) wrote: Great colors and details. Excellent work Paolo, bravo!!! eyeswideopened@RAW-Shooter (Homepage) wrote: stunning colors! well done shot! claire (Homepage) wrote: wow. the shades of red are just wonderful and the details of the bug is just amazingly clear. very nice. martie (Homepage) wrote: Gorgeous! So warm with all those reds, and a perfect macro of the little critter! A.B.C. Photography (Homepage) wrote: Simply beautiful! Terry H. (Homepage) wrote: Wonderful macro of one of the good bugs in the world. Awesome shot! Nicki (Homepage) wrote: this little man rocks, so colorfull and detailed! AC (Homepage) wrote: One of my favorite insects - great details and a beautifully composed capture. Rachael (Homepage) wrote: These folds of red are stunning. Ilger.nl (Homepage) wrote: I think these photos are so cool. Unfortunately I'm not able to take such pictures so I enjoy seeing these at your blog. Beeps and Chirps (Homepage) wrote: What a macro! Olivier (Homepage) wrote: Superbe macro-photographie. Avec juste la profondeur de champ qu'il faut. Florence (Homepage) wrote: So nice, and cute ! Lovely compo... great crop and the colors are obviously superb... Well done. Delicacy itself. 613photo (Homepage) wrote: I haven't seen a ladybug in years. Very cool against the red with the shallow depth-of-field. Laurie (Homepage) wrote: This is superb! The color is amazing and of course the detail in the little lady bug is splendid. Sobral (Homepage) wrote: Davvvero bella, nella composizione, nel soggetto, nei colori, tutto. Bravissimo! Andrew (Homepage) wrote: Brilliant color and composition! A very joyful image! Tom (Homepage) wrote: Nice colours. I like the way the red goes darker from left to right. Peety (Homepage) wrote: Great macro shot! Simone (Homepage) wrote: Macro with great deep of field and composition but with the light to hard. Elaine- (Homepage) wrote: what a niiiiice little lady bug!! one of the sweetest macros i've every seen!! well done you!! Urbansand (Homepage) wrote: Beautiful reds. I like how the dark folk of the flower makes the back of the ladybug standout. vera (Homepage) wrote: original and not so easy in the same tones, excellent-just the foregroung on the right disturbs a little the main subject bu but..
sherri (Homepage) wrote: A ladybug is probably the only bug I can stand to look at. Love the darkness in this image. Zing (Homepage) wrote: Great capture of the little ladybug. Nice colours and dof. mbecher (Homepage) wrote: I love that red. Also the poor ladybug looks like he is going to fall in a moment. grant (Homepage) wrote: spectacular macro! Tom (Homepage) wrote: Shades of red indeed. Beautiful shot. Marcie (Homepage) wrote: Stunning detail. WOW! Giovanni (Homepage) wrote: Bella, bellissima! Perfetta composizione dell'imagine e magnifici colori! Calusarus (Homepage) wrote: What a bokeh in this macro : colors are so nice ! Luan (Homepage) wrote: Excellent composition! David H-W (Homepage) wrote: Lovely macro with some great detail and colour. Riccardo (Homepage) wrote: Luminosa, molto colorata, ben composta. Molto bella questa foto anche se, per miei gusti personali, avrei saturato un po' meno i colori. Ciao, Riccardo.